Time was that English football clubs were local things owned by local folk, stout yeomen, pillars of the community who had made their money in some tangible commodity like steel or meat or, if they were particularly highfalutin, property. A fistful of that hard-earned would be invested in the club on whose terraces the owner had stood as a kid, and then he would disappear from view, keeping his head down and his team ticking over. Then came the Premier League and the Champions League, and all sorts of things that were sufficiently important in this new world order as to have capital letters assigned to them, and where we are now is that the domestic boardroom is basically heading in two directions. In the lower leagues, a swelling rank of supporters’ trusts keeps tradition alive, relationships close and overheads low. Meanwhile, among the big boys, the aspirational upstarts or the once-great clubs now fallen on hard times, mysterious consortia comprised of faceless thirty-somethings who have carved billions upon billions out of oil or software or simply money itself endlessly shovel exponentially-increasing amounts of the stuff into the coffers in the hope of one day becoming the nearest thing the modern world has to an empire. All of which is, of course, something of an oversimplification. It is, nevertheless, a little sad to see the news that Ray Trew, the owner of the world’s oldest football club – a club which more recently helped get the whole supporter-owned movement started – is in the process of selling that club to American (or possibly Chinese) investors. But at least if that deal does go through, things should probably go a little better than last time. Before 2009 most people outside of Nottingham could have told you one thing about the history of Notts County Football Club, two at a push. Its venerability is reasonably common knowledge among football cognoscenti, while the particularly well-informed would have added that, since a bit of a to-do about some pink shirts fading too much a century or so back, Juventus have played in their kit; and that would have been the sum total of it. Because Notts have never been a club to thrust themselves into the limelight with anything so prosaic as on-pitch performance. In the inaugural 12-team Football League in 1888–89, they finished above only Stoke City. In their first FA Cup final appearance two years later, against a Blackburn team that they had beaten 7-1 only a week before, they contrived to slump to a 3-1 defeat. They made up for that quickly enough, beating Bolton Wanderers 4-1 to win the cup four years later, but have never made it back to a major domestic final since. A lower-league championship or two and the 1994–95 Anglo-Italian Cup aside (in which they won two out of seven matches, including a ripsnorter of a semi-final against Stoke that saw three and a half goalless hours across two legs before Notts won 3-2 on penalties), there has been not so much as a silvery sausage in the 122 years thereafter. Inevitably, in this long and undistinguished history that has taken Notts up and down the professional divisions without making much of an impact on any of them, with a small fan base and limited commercial viability, they have sailed close to the wind financially on occasion. The autumn of 1986 saw them come particularly close to liquidation, with debts of close to £2 million, and it was only the launch of a prize draw – the Notts County Lifeline, which still supports the club – and a friendly match with Nottingham Forest that kept them afloat. Four years later, back-to-back promotions under Neil Warnock left them a season’s top-flight survival away from the inaugural Premiership – whereupon, in something of a nod to history, they finished second from bottom again, got relegated, and slid back down into the doldrums. Sam Allardyce came in as manager and back up they came, winning the Division Three championship by 19 points in 1998; Allardyce was poached by Bolton and down they went. Two failed takeovers and eight years later, it took a comeback from 2-0 down to salvage a final-day draw against Bury to keep them in the Football League. After all of which, when in the early summer of 2009, someone posted on the forum of the Notts County Mad website that “tomorrow will be the best day of your lives”, and then the day after, a Middle Eastern consortium calling itself Munto Finance turned up at the gates promising untold riches, many might have felt that the good times had been a long time coming. 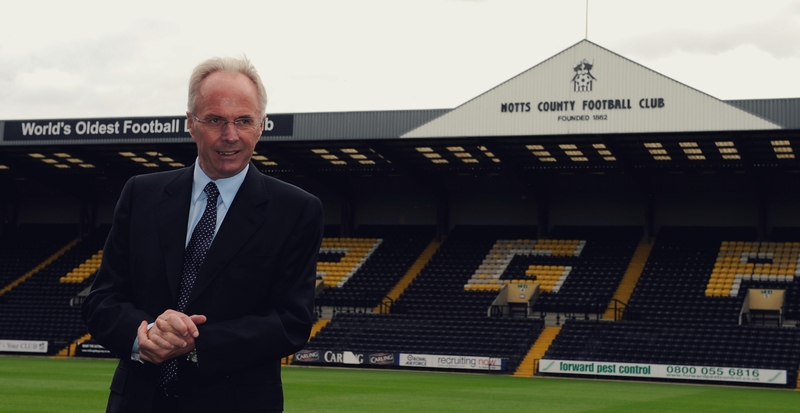 Six years earlier, Notts’ latest dalliance with financial oblivion had wound up with its supporters’ trust taking control of the club. If such is increasingly the way of things in the lower reaches these days, back in 2003 it was about as common as a Middle Eastern windfall. AFC Wimbledon had been scraped from the ashes of Wimbledon FC a year earlier, and just a few months before, four Exeter City fans had taken a £20,000 cheque to the previous owner’s jewellers’ shop to buy their club during a lunch break, but that was about it. What’s more, fan ownership was not perceived as the panacea that it is now. Previous experiments at clubs including Brentford and Chesterfield had been seen, rightly or wrongly, as failures, and sure enough by 2009, the people who owned Notts were far from universally popular with those whom they purported to represent. “Greatly frustrated” is one of the comments below the line on a report in The Guardian from shortly after the takeover. “Local busybodies”, an intriguing suggestion of “undisclosed freemasonry” and “would have voted yes to Osama Bin Laden taking over the club” are some of the others. The sale of the trust’s shares to Munto, then, less than a year after huge torrents of money had started gushing into Manchester City from a similar part of the world, was always likely to be a formality. But even from the outset, there was an oddness about it. The transfer of ownership in 2003 had been one thing, with a shadowy figure offering a large sum of money to keep the club afloat, and gifting the trust his 49 percent stake on the basis that he would be repaid its value if and when the shares were sold on. That shadowy figure had been revealed not long after, however, as Haydn Green, a modest millionaire from within the existing fan base. These new figures were quite a bit shadowy-er. For a start, it seemed that Munto Finance was a subsidiary company of Qadbak, which in turn was a Swiss company based in the British Virgin Islands, and had some sort of connection with yet a third company by the name of Swiss Commodity Holding. If that wasn’t confusing enough, the nature of Qadbak’s business and the source of its money were opaque, with official statements describing it only as being the representation of “certain Middle Eastern and European-based families”; and even in September, two months after the takeover had been completed, Glenn Rolley, the supporters’ trust chairman, could only go so far as to say that he knew “some of the origins of some of the investors”. In an effort to clarify matters, a statement would eventually be published on the club’s official website purporting to be from a man called Anwar Shafi, which confirmed that families by the names of Shafi and Hyat “have a significant holding in Qadbak and are very pleased with the diversified range of assets we have invested in”. Only a couple of problems would emerge with that. For one, a few days later, Anwar Shafi told The Guardian: “It’s not me. This statement was not made by me. I have no investment of any sort in Qadbak. I have no role in the club.” As for the Hyats, the only link that would come out to any Hyat would be to a wanted fraudster called Abid Hyat Khan. But most of that was for another day. People didn’t know what they didn’t know in early June 2009, when the trust convened a meeting to ratify the sale. Which was just as well because by all accounts, John Armstrong-Holmes, a trust-elected director and chairman of the club, didn’t tell them much. What he did say was that Munto – whoever they were – wanted to invest directly rather than “embark on heavy expenditure to acquire the club”, and so had asked for the trust’s shareholding to be gifted to them rather than sold. If that in itself maybe ought to have raised eyebrows, the accompanying suggestion that Green’s estate (the man himself having died in 2007) was not entitled to repayment of the money with which he had effectively saved the club was jarring. What excited the fans – and the majority of the fans were very excited indeed – was somewhat more material. Sven-Göran Eriksson, who had been the England manager just three years earlier, came in as Director of Football, and suddenly Notts were being linked with Christian Vieri and Patrick Vieira, Dietmar Hamann, David Beckham and Roberto Carlos, not to mention the recently retired Pavel Nedvěd and Luís Figo. Jorge Andrade, a European Championship runner-up with Portugal at Euro 2004, trained with them as he looked to bounce back from an injury-ruined couple of years at Juventus. Then goalkeeper Kasper Schmeichel signed from Premier League Manchester City and striker Karl Hawley from Championship side Preston North End. This heady atmosphere found release in early success on the field. Nine unanswered goals against Bradford City and Macclesfield Town took Notts top, before an away defeat at Chesterfield was followed by a 3-0 hammering of Dagenham and Redbridge. Then it got even crazier. Sol Campbell – double Premier League winner Sol Campbell, three-time World Cup squad member Sol Campbell – was whisked into the ground with a coat over his head, and signed a five-year deal a few days after the Dagenham and Redbridge match. He took a couple of weeks to get up to full fitness (by which time Lee Hughes, another of the summer signings, had already picked up his second hat-trick for the club in a 5-2 thrashing of Northampton Town), and made his debut against Morecambe on 19 September. Beyond a clip of a spectacular overhead kick from Schmeichel that was inches away from salvaging Notts a late point (do have a look for it on YouTube, it’s quite an effort), there isn’t much footage around of the Morecambe game. Eyewitness accounts of Campbell’s performance, though, are not flattering. Notts lost and, within days, Campbell had gone, his contract cancelled by mutual consent after less than a month amid mutterings from his end of broken promises. If that was the first public indication that things weren’t all running smoothly behind the scenes, it certainly wasn’t the last. The popular Ian ‘Charlie’ McParland, veteran of eight years and over 200 games for the club as a player, and who was finally enjoying some success after two years in the manager’s job, was abruptly sacked and replaced by Hans Backe, a journeyman Swede who had been trailing after Eriksson at Manchester City and Mexico for the previous couple of years. Meanwhile, rumours were beginning to swirl of unmet bills and multiplying debts. On the pitch there was a bit of a wobble, with six draws in seven games over October and November; and then just as things seemed to be stabilising, with consecutive wins over Darlington and Hereford United, it all fell apart. On 10 December Munto abruptly put the club up for sale. Trembling admitted that the “several millions” promised to the club had not materialised, and within days Backe had resigned, leaving assistant Dave Kevan in temporary charge. Trembling held on for a couple of months, desperately scouring the world with Eriksson in search of the huge sums of money needed to meet the financial obligations that Munto had lumbered Notts with, but to no avail, and by February both were gone, the club sold on to local businessman Ray Trew for £1. It took another year for some of the facts to come out, in a BBC Panorama report eye-catchingly entitled The Trillion Dollar Con Man. The whole thing, according to the programme, had centred on Russell King, a convicted fraudster who had made shady deals around the world based on an empty promise of billions of dollars from Bahrain. The Notts County takeover deal specifically had supposedly been underpinned by a £5 million bank guarantee from First London plc; the trouble with that was that the guarantee was unapproved by the bank’s board and came from a part of the bank which no longer existed. In any event, First London plc went into administration in 2010 with debts in the region of £8 million. Ultimately, while King’s name didn’t appear on any documents – of the various companies whose names cropped up during the documentary, the common refrain was that he had never been a shareholder, trustee, director or beneficiary of any of them – the BBC felt confident enough to say that he was “bossing Notts County”, and Philip Sinel, a lawyer quoted on the programme, to say that “there are strong indications that he’s a serial fraudster”. And as things now stand, King – currently holed up in Bahrain – is reportedly being sought by the Serious Fraud Office, the Financial Services Authority and, perhaps most fearsomely of all, Nottinghamshire Police. Meanwhile back at Notts County, with King, Munto, Qadbak and all having vanished, Trew found £7 million worth of debt, even with Eriksson writing off much of what he was owed, alongside what were described as “unusual” payments on the books totalling almost £200,000, many going to Bahrain. And the mess is still being cleaned up – last year, with nearly £20 million having been invested, the club was still reportedly trading at a loss. It’s easy to think now that it didn’t really happen. The official Notts County website has consigned Munto Finance to a few cursory mentions in its history pages, and the fans don’t really talk about those days any more. That season ended in promotion under Steve Cotterill, with Lee Hughes becoming the first Notts player for 60 years to score 30 in the league, but after a few years of scrabbling around one division up, Notts are now pretty much exactly where they were in the summer of 2009, pottering around in the lower reaches of League Two, and none of the big names are still there. But if push comes to shove, does any Notts fan – would any fan of any team – really regret those days? At the very least, if anyone asks about the history of Notts County now, there are three things to say. They are the oldest professional club in the world, Juventus owe them their kit, and they were the fourth-tier team for whom Sven-Göran Eriksson once signed Sol Campbell.